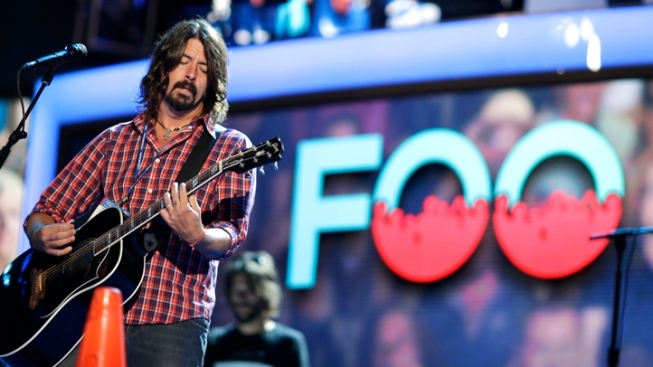 "What we did in here is just a huge, huge miracle"
Foo Fighters frontman Dave Grohl strikes a chord during a sound check at the Democratic National Convention in Charlotte, N.C. in 2012. A conductor in front of the setting sun counts out a beat, then scores of drum sets, electric guitars and basses crash to life in a rousing, rocking rendition of "Learn to Fly." That's how this epic love letter to the Foo Fighters begins. The seven-minute video of 1,000 musicians playing the rock band's popular song was made to convince the Americans to play a concert in Cesena, on Italy's east coast. "Come and play in here, give a concert to all of us in Cesena," says Rockin1000 project leader Fabio Zaffagnini in the video. But the chorus that belted out "I'm looking to the sky to save me" didn't need divine intervention for their dream to come true. Posted on Thursday, July 30, the project's video passed 10 million views on YouTube within two days; among the viewers was Foo Fighters frontman and former Nirvana drummer Dave Grohl. He posted his own video where he promises, in Italian, that his band is coming to Cesena. "This video, was good! Super nice. Thank you so much," he said, according to the BBC's translation. "We're coming, I swear. We'll see each other soon." It's not clear yet when the Foo Fighters will visit, but just asking them to come was a massive undertaking, according to Zaffagnini. He said the video took one year to put together and that the army of participants that came to the Cesena video taping were all volunteers. "Italy is a country where dreams cannot easily come true, but it's a land of passion and creativity, so what we did in here is just a huge, huge miracle," Zaffagnini says.